In case of emergency, please contact the police department dispatch at (405) 793-5171. Come visit our pets available for adoption today and give one or more of these a forever home. $70 adoption fee - Animals are tested and vaccinated for species specific diseases (dog & cat), spayed or neutered and Micro-chipped prior to adoption. These pets were found stray in our community and waiting to return to their home. $35 impound fee + $25 Rabies Deposit. Owners are required to show proof of rabies vaccination. A $25 rabies vaccination deposit will be required for animals that do not have appropriate paperwork. Owners can receive a refund of the rabies deposit when the vaccination is completed and paperwork is returned to City Hall. 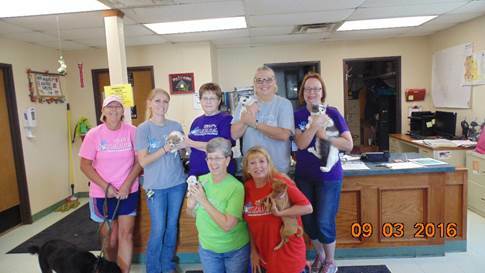 Are you interested in volunteering your time, talents, or ideas to help animals in Moore? 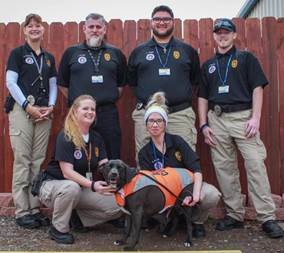 The Moore Animal Shelter is seeking interested citizens to join us as volunteers as individuals or they are welcome to join Moore Pawsabilities Inc., which is a 501c3 non profit organization. Individuals can register to be on our email list and be notified about special volunteer opportunities. We are in the beginning stages of this process so please be patient with us. Your donations are greatly needed and appreciated. Living with wildlife can present certain challenges. Here�s some helpful tips. 1. Remove food sources. Pick up leftover dog and cat food at night and keep bird feeders out of their reach (or bring them in at night). Don�t let spilled food accumulate on the ground. 2. Prevent access to chimneys with a commercial cap made of sheet metal and heavy screen over the top of the chimney. Repair soffits to prevent access to attics and install strong, metal vent covers. Keep dampers closed when not in use, but consult a knowledgeable source to prevent a fire hazard. 3. Prune tree limbs away from the roof (10 feet away is best) or install a 3-foot wide band of sheet metal (6 feet above the ground), around the trunks of trees which overhang your house. This will reduce access to your roof by raccoons and squirrels. 4. Garbage cans should be made of heavy metal and have lockable or tight-fitting lids to prevent access; otherwise, keep them indoors as much as possible. 5. Install metal skirting (i.e. strong hardware cloth) around the bottom of a deck to prevent a wild animal from making a den underneath. 6. Provide shelter structures for fish in ornamental ponds and water gardens; cover the pond during the night with metal screening. 7. Cover window wells with grates, bubbles or hardware cloth. 8. Seal up holes around and under home foundations to help keep out mice, rats, insects and snakes. You can bury � inch mesh hardware cloth 1-2 feet deep in places where animals might gain access to your crawl space through digging. 9. Fence gardens and cover fruit trees and berry bushes with netting, or use an approved non-toxic repellent spray. 10. Repair broken, weak, or rotted areas on the roof, soffit, and fascia of your house. Here are some of the most common questions we encounter. Q. 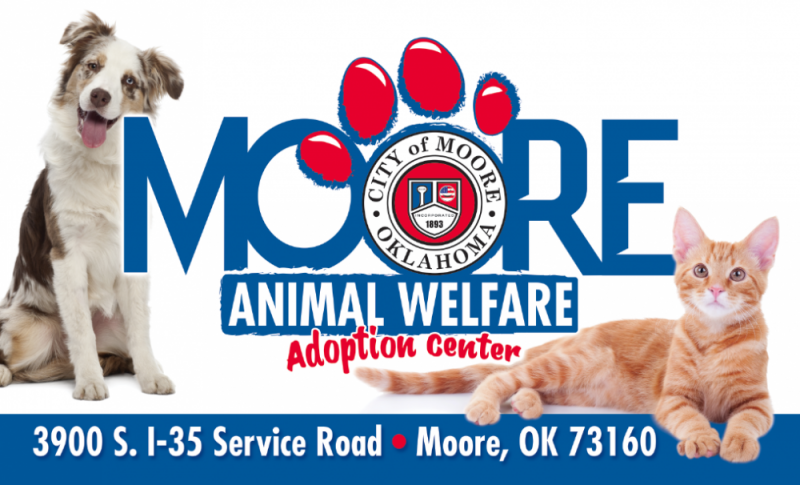 How many animals (dogs or cats) can I have if I live inside Moore city limits? A. Up to 4 animals over six months (adult) of age are allowed, per household. Proper city licensing must be obtained for each adult animal. Q. Is there a city licensing requirement? A. Yes, city licenses must be obtained from the Animal Shelter yearly for a fee of $2.50 for each animal over 6 months of age. You must bring the animals Rabies Certificate to get a city license. Q. Can my pet run around outside to roam the neighborhood? A. No. Dogs must be confined to a fenced area or be on a leash. Cats must be kept indoors or monitored while outside. Q. If my dog stays indoor most of the time, do I have to have a dog house? A. Yes. Anytime a dog is outdoors it must be provided adequate shelter form the elements, i.e. rain, cold wind, direct hot sunlight, etc. A doghouse must be large enough to stand upright, turn around and lay down comfortably and have a solid floor. Or the animal must have access to enter the house or garage, i.e. dog door. It must have a shaded area and access to water in a spill proof container. Q. Can I have chickens if I live in Moore city limits? A. Only if you are zoned agricultural. Q. Can I have exotic animals (no venomous snakes, lions, tigers, leopards, panthers, bears, alligators, crocodiles, monitors, apes, elephants, rhinoceroses) in Moore city limits? A. You must be licensed by the State of Oklahoma yearly. We request that you notify the Animal Shelter if you have exotics for yours and the animals safety.